Dennis Muilenburg, the chief executive officer of Boeing, is the only of seven new trustees who did not graduate from Northwestern. The six others come from backgrounds in finance and consulting, among others. The head of Boeing, the world’s largest aerospace company and top U.S. exporter, is the only of seven new trustees announced Monday who does not hold a degree from Northwestern. 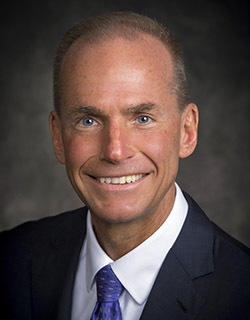 Dennis Muilenburg, the chairman of the board and chief executive officer of the company, graduated with engineering degrees from Iowa State University and the University of Washington. The six others are Alicia Boler Davis (McCormick ’91), Larry Gies (Kellogg ’92), Larry Irving (Weinberg ’76), Jennifer Leischner Litowitz (Weinberg ’91), Purnima Puri (Weinberg ’93) and Paul Schneider (Weinberg ’96, Kellogg ’11). The new trustees were nominated by a Board of Trustees committee and approved by a unanimous vote of the full board at its June meeting, said Jon Yates, a University spokesman. The trustees come from various backgrounds in manufacturing, consulting and investment and lead companies like the Irving Group, HPS Investment Partners and Schneider Resource Holdings. Boler Davis, the executive vice president of Global Manufacturing for General Motors, has held many positions in manufacturing, engineering and product development throughout her career and has been recognized by numerous organizations and publications for her professional accomplishments and community service, the release said. Irving is president and CEO of the Irving Group. In the past, Irving served as vice president for global government affairs for Hewlett-Packard, the world’s largest technological company, the press release said. Gies is the founder, president and CEO of Madison Industries, “one of the largest and most successful privately held companies in the world,” the release said. He also serves as the president of The Gies Foundation, which focuses on youth, education and health.